UK architect Simon Astridge has used shipping containers, exposed plasterwork and clay lighting to create the offices and showroom for a London tile manufacturer. Astridge designed the Porcelain Gallery for Pentagon Tiles in a conservation area within Hatton Garden in London’s Camden. As part of the brief, Astridge was tasked with creating office space in the backyard of the showroom, and so chose to use shipping containers as a reference the industrial history of its location. Three of the containers are joined to form an open space on the ground floor, while the fourth is set on top at an angle to offer views of a nearby tree. The project follows a continuing trend for repurposing old shipping containers, which have been reused for everything from a pop-up cinema to swimming pools and hot tubs. Astridge chose to paint the exterior of the units red and yellow to complement the hues of the surrounding listed buildings. Sliding glass panels are slotted behind the original container doors to bring plenty of light into the space. A large window also replaces one of the walls of the lower containers. A Corten steel staircase leads alongside this to the upper level, where matching steel railings front the roof terrace. The offices are finished simply inside with light plaster walls and clay lights, offset by a teal green shelving unit and greenery. For the showroom, the architects wanted to create a space that set Pentagon apart from its competitors, using clay for the entrance buzzer and the staircase handrail. “I want my clients to walk into a space and not be able to keep their hands in their pockets,” said Astridge. Inside, the main feature is the ceiling, which is coated in a light pink textured plaster and covered with a timber structure that forms frames around clay pots. Built-in metal shelving runs along one wall, housing the companies products, and a large glass and wood cabinet in the centre. Large grey tiles cover the floors and line one of the walls, while another other is left with exposed plaster. The Porcelain Gallery is one of a number of materially focused projects by Astridge, who is based in Tufnell Park, north London. Other projects include a dusty-pink concrete extension to north London house, lining walls of Japanese-styled apartment in London with rustic clay, using textured surfaces for a “wine cave” beneath a south London kitchen showroom, and a leather-lined dressing room in a refurbished residence. 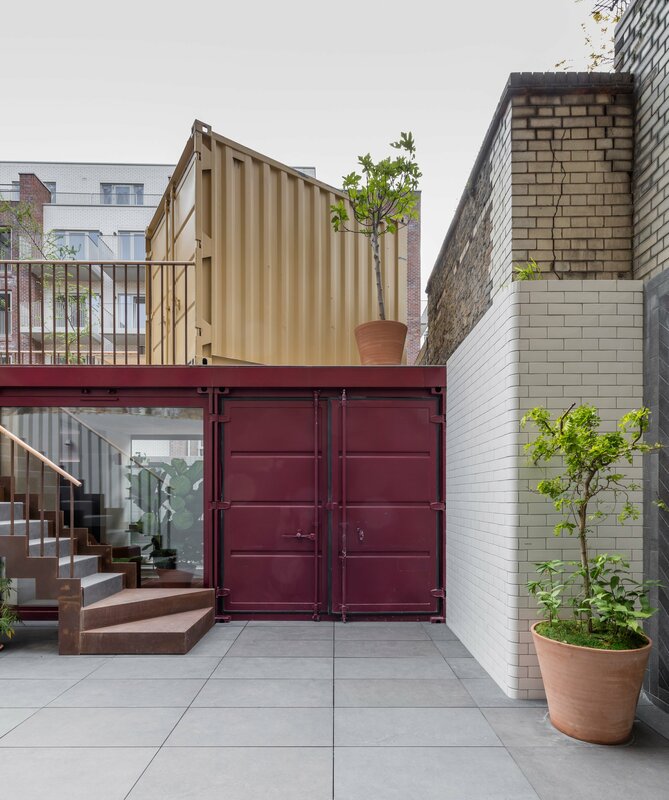 The post Simon Astridge stacks shipping containers to create backyard London office appeared first on Dezeen.